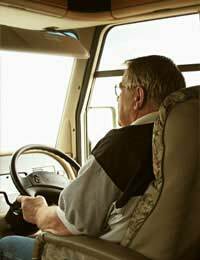 Home > Transport > Quiz: Are You Safe to Continue Driving in Old Age? As you get older, your eyesight may begin to deteriorate and your reactions may become slower. This can have an impact on your ability to drive safely. There is no set age at which you need to stop driving, but there may be certain signs that suggest that it is a good idea to do so for safety reasons. Take our quiz to see whether you are still likely to be deemed a safe driver. Q1: Can you read vehicle number plates from a distance of 20.5 metres (for the old-style number plates) or 20 metres (for the new-style number plates)? Q2: Do you suffer from any visual problems affecting one or both eyes (apart from being long or short sighted)? Q3: Do you suffer from decreased mobility, especially in relation to your hands and feet? Q4: How would you rate your hand-eye co-ordination? Q5: Are you finding yourself involved in more accidents and/or near misses while driving than used to be the case? Q6: Excluding visual problems, do you suffer from any medical conditions that could make you unfit to drive? (These can take many forms, but common examples include epilepsy, diabetes mellitus, renal disorders, sleep disorders, angina, profound deafness, AIDS/HIV and malignant tumours). Q7: If you answered yes to the above question, have you notified the DVLA of this? Take a look at your answers and work out whether you should really be informing the DVLA of changes in your health or ability to drive. You seem to still possess the necessary skills to be classed as a safe driver, although there may be one or two areas that you are experiencing a decline. On the whole, you seem to possess most of the following: the eyesight requirements with no significant eyesight defects that will affect your driving skills; good perception and co-ordination skills; and no significant mobility problems that would make driving unsafe. As a result, it is unlikely that the DVLA would want to revoke your driving licence unless you develop or have developed a medical condition that will affect your driving ability. If this happens, contact the DVLA as soon as possible. It seems that age may be catching up with you in some respects as you are beginning to lose some of the skills that previously made you a safe driver. Losing mobility in your hands and feet or elements of your hand-eye co-ordination may seem minor but they can result in more accidents and near-misses while driving. If you have any medical conditions that would affect your driving, it's vital that you tell the DVLA so that they can decide for themselves whether this is the case.